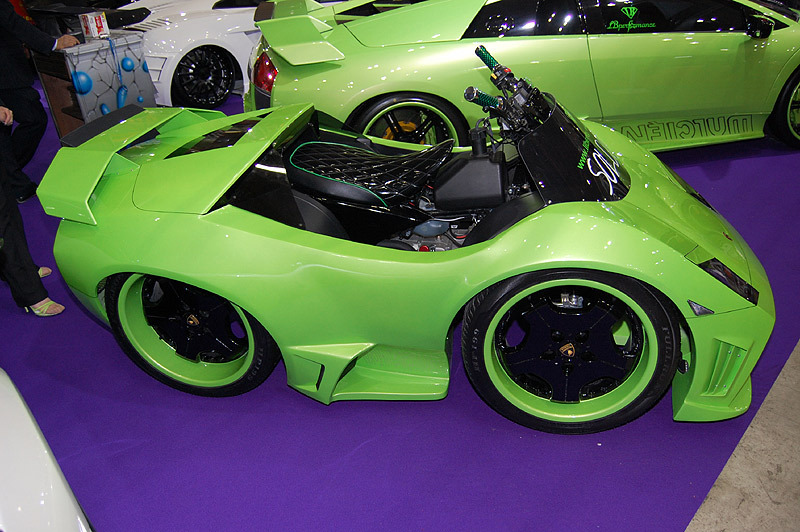 The 2009 Tokyo Auto Salon was loaded with the usual assortment of wild and wacky tuner fare – same as always. But tucked among the cars are hidden treasures like the wee beastie shown above. Liberty Walk/LB Performance are Japanese Lamborghini tuners, and in addition to showcasing a selection of the supercars they've worked on, they also showed off a couple of ATVs they re-bodied to look like super deformed little Murcielagos. Miniaturized dimensions, big alloys, low-profile tires – this is what Power Wheels would look like if they made 'em for grown-ups and cost $20,000. it have lambo in its name, wat u expect? can i drift on it?